IDC recently released their global smartphone shipment figures and the list of top five vendors looks very different from what an industry watcher may have been used to. While Samsung and Apple have retained their industry leading positions, RIM, HTC & Nokia no longer make the list and have been overtaken by Sony, ZTE & Huawei. Let's take a look at the drivers of success & failure in this market. The chart above clearly shows Apple & Samsung's hold on the smartphone market. While Samsung's growth has been consistent, Apple's growth has been more volatile in recent quarters. Instead of focusing the obvious (Apple & Samsung), let's take a look at the rest of the market. 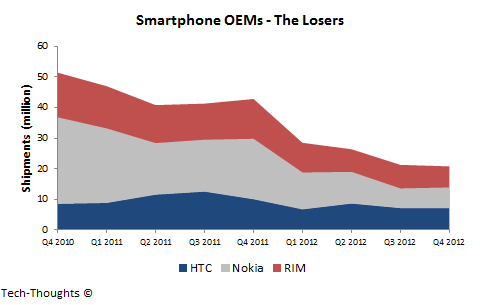 HTC, RIM & Nokia have clearly been marginalized, while the "Others" have gained steam, nearly matching Apple & Samsung combined. In the face of increasing competition from Samsung's Galaxy series and Apple's iPhone, HTC's biggest failure has been its inability to establish a coherent branding strategy for its Android-based smartphones - This is something that even Nokia has managed to pull off with the Windows Phone-based Lumia series. With multiple devices and weak sub-brands, consumers shifted away to stronger sub-brands from competing vendors. HTC did attempt to correct this strategy with the One series and then promptly added to its Desire line, further confusing consumers. At this point, HTC's only hope is to focus on a single branding strategy for all its devices and focus on establishing these brands in emerging markets. 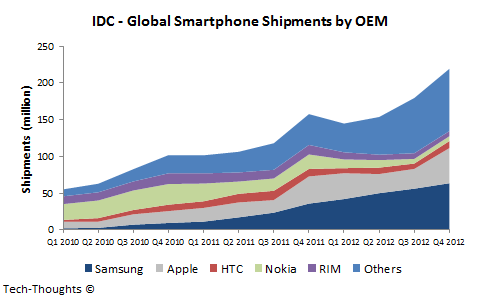 Apart from the obvious winners in Apple & Samsung, the "Others" category seems to be dominating the smartphone market. 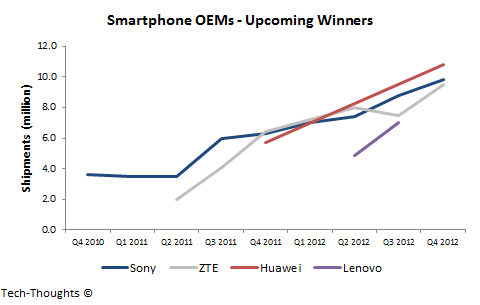 Within this category, ZTE, Huawei, Lenovo & Sony have been the strongest players, growing from less than 5 million combined smartphone shipments in Q4 2010 to more than 35 million in Q4 2012. There have been two distinct strategies at play here, which need to coalesce to continue growth. ZTE, Huawei & Lenovo's started with a high volume strategy in China and are now expanding to higher end models & markets (this is the strategy I had advised Nokia to follow with the Lumia series). On the other hand, even though Sony released a wide range of Android-based devices, it has focused on building its Xperia brand in all markets (essentially the anti-HTC). Now that smartphone penetration in mature markets has begun to reach saturation, the winners going forward will be those that are able to effectively capture growth from emerging markets. Apple's Q1 results have shown that the iPhone's growth has begun to slow and without a cheaper iPhone or a deal with China mobile, that will continue. Samsung is likely to remain the market leader and will be followed by companies with strong positions in emerging markets, combined with strong branding strategies to move up-market. While smartphone margins will begin to sink as hardware commoditization becomes a reality, the winners will be the ones that effectively counter it with volume growth.